We’ve rounded up the best advice for fine thin hair…. 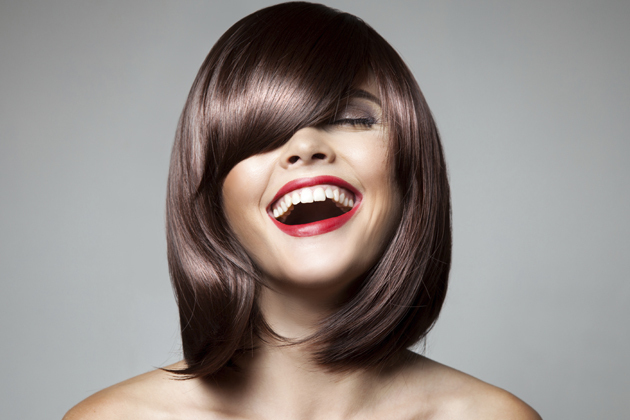 Giving fine hair the chop can suddenly make it seem much thicker. A long bob, that hangs below your chin, is a great style for those who don’t want to go too short. Some clever highlights and curls will give your fine hair some much needed texture and body. Eating more protein can actually help reduce hair loss. Experts recommend you try upping the protein you eat for a week and see if you notice any difference. Low iron is one of the main causes of fine, thinning hair so try to reboot your hair from the inside out by eating more iron rich foods. Try spinach, lean red meats and green leafy veggies. A healthy scalp equals healthy hair so try and keep it hydrated, out of the sun and moisturised. If you have a sensitive scalp or dryness try a product specially designed to help. Fine hair can often be flyaway and unruly, so pulling it back is a good way of keeping your hair neat. For giving an illusion of thicker hair, keep your hairstyles loose, allowing a few strands to fall around your face. To stop long hair looking thin style the front sections with a loose wave to create movement and texture. Try a relaxed topknot if you suffer from fine hair – it’s a quick easy style that leaves hair looks thicker, plus it works for day and night. Have some layers cut into the front sections of your hair and then style them into flicks so help finer hair look thick. A very clever blow-dry can give lank looking hair the boost of life it needs. Flicking out the ends works wonders too! If you have fine, long hair, don’t let the layers get too long – you get more volume if you have soft layers framing the face. Adding a fringe distracts from the fact that the hair is fine too. Chunky bobs can be great on fine hair as they give structure and the impression of width. Short choppy fringes also work well because they make the hair look denser and thicker. Short styles are good for fine hair as they create movement and texture and are easy to shape and style. Beware that over-styling fine hair can accentuate it’s thinness. The graduated bob is not only one of the most classic haircuts, it’s the perfect cut for fine hair. It keeps a strong shape even when the hair drops throughout the day and when well cut, always looks immaculate. The Aussie 3 Minute Miracle Light Aussome Volume Deep Treatment Mousse, £4.99, is a rinse off conditioner containing nutrient rich sea kelp that weightlessly conditions dry, fine hair. You’ll see a gentle increase in volume without weighting it down. Percy Reed’s No Oil Oil, £14, is enriched with Vitamin B5 to nourish and protect your hair, as well as being packed with frizz-fighting pomegranate oil to banish those wayward strands. Fine hair can often be flyaway and unruly, but Percy Reed’s product will help you keep it under control. For an instant, fuss-free boost, Got2B’s Volumising Powder from Schwarzkopf, £4, is the solution. Simply sprinkle into the roots and rub in with your hands to add volume and lift hair from the scalp. Perfect to use before a night out for a little extra hair height. Prep hair before styling with a body building mousse such as the Salon Science Cellumax Volumising Foam, £15, by applying directly to the roots. Dry in the product by flipping your hair upside down trick – It’s an old trick but it works! L’Oreal Paris’ Elvive Fibrology Thickness Booster, £5.99, will give you fuller hair instantly. It contains their highest level of filloxane, a unique molecule that penetrates the hair strands and swells up inside it increasing the hair diameter. It’s perfect pre-special occasion or before a night out. America could hold the solution to your hair thinning problems. Nioxin is the no.1 stylist recommended thinning hair brand in the USA with 70% of testers noticing hair looked thicker in 30 days. The Nioxin Hair System Kit for normal to thin hair, £29, works in three steps to cleanse (shampoo), condition (conditioner) and treat the hair and scalp.